I felt like a paparazzi taking pictures, but I couldn't help myself! Giddy over Garmins (and quite possibly hopped up on sugar) - good times! Pure joy on their faces - love it! The wedding cake was so pretty, decorated with fresh flowers. The groom's cake was too funny - a mug of beer, with the A&M logo on it (their grad school alma mater), and a can of Lone Star beer...Phillip is a Texan, through and through! There was a DJ and dancing; after the traditional first dances, they called all of the married couples onto the dance floor, where we danced for a minute before the DJ announced that anyone married less than a year had to leave the floor. Then anyone married five years or less, and he kept going, and people kept leaving - and we were still out there, which felt so weird! I'm not old enough to be one of the old married couples out there on the dance floor!!! He called out 30 years and we were there with three other couples - finally, we got cut when he called out 35 years or less. Phillip's grandparents were the winners - they've been married over 50 years. It was fun to be included in this, but also a little disconcerting. How can we part of the last few older married couples when I remember OUR wedding reception so clearly?? We had such a great time and it was really special to have been on this journey with Phillip and Sarah - when we met them, they were dating, and then there was the big proposal, and now finally the wedding - congratulations to Phillip and Sarah, and thanks for taking us along on the ride of your life! What a lovely happy post and such a happy day. Thanks for sharing. 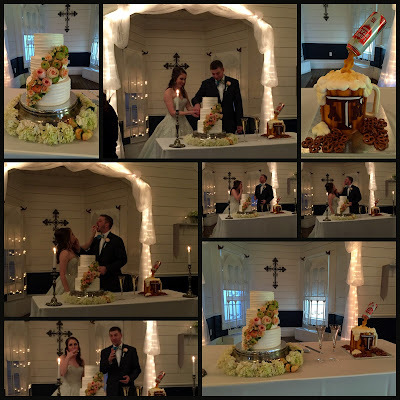 I love it when the groom's cake really represents something fun about the groom. What a fun wedding in general. You and Jeff look like newlyweds yourself! Aww congrats to your friends. Looks like a lovely wedding and those cakes, wow. How did that bottle stay on? What a beautiful wedding! And those cakes! The groom's cake is really neat! LOL! Be proud that you were still out there - that is awesome! Congratulations to the lovely new couple! How cool is that. What a beautiful affair.